A Save the Children/Unicef report released in September 2016 found that the government’s deterrence policies against refugees cost a total of $9.6 billion over four years between the 2013 and 2016 financial years. This includes the cost of detention both in Australia and on Manus and Nauru, as well as the government’s turnback policies. Between 2012-2017, operational and infrastructure costs of offshore immigration program alone has cost more than $5 billion. That matches up to figures provided to the treasury Senate estimates committee which reveal that in 2016-17 the government spent a total of $4.06 billion on border protection. That figure included $1.57 billion for onshore compliance and detention, $1.08 billion for the “offshore management” of so-called “irregular maritime arrivals”, and $1.06 billion on border enforcement. This means a cost of around $1 billion per year for offshore detention. To put this into some perspective, the Federal Government Budget in 2016-17 included $1.2 billion for courts and legal services for the entire country, $1.7 billion on vocational and industry training, $1.4 billion on arts and cultural heritage, $1 billion on rail transport, only $904 million on environmental protection. It has cost $1 million each for every detainee imprisoned on Manus Island since 2012, according to the Parliamentary Library. That one detention centre alone has cost around $2 billion over this period. This enormous sum could instead reverse government cuts and boost spending on health and education. It is a stark example of the government’s priorities. Detaining a single asylum seeker on Manus or Nauru costs $400,000 per year, according to the National Commission of Audit in 2014. Amnesty put it at $570,000 per person in a 2016 report. Detention in Australia costs $239,000 per year. By contrast, allowing asylum seekers to live in the community while their claims are processed costs just $12,000 per year, one twentieth of the cost of the offshore camps, and even less if they are allowed the right to work. The Liberals are running a scare campaign about refugees. They seek to paint refugees as “economic migrants”, “country shoppers” or worse, equate refugees with terrorists. In reality, approximately 90% of those who arrive by boat are legitimate refugees. Tony Abbott famously promised “no cuts to health, no cuts to education.” But the Liberals under both Abbott and Turnbull have delivered ongoing cuts to schools, Medicare and welfare. The government loves to claim success in “stopping the boats”. They use the claim that refugees are some kind of threat as a scapegoat to try to distract attention from budget cuts and attacks on workers—and the fact that the real threat to our living standards is the Liberal government. Immigration Minister Peter Dutton put this most crudely during the 2016 election campaign, saying more refugees would only “steal Aussie jobs” and “sit on Medicare and welfare”. Turnbull claims that stopping the boats is about saving lives at sea. But processing asylum claims in Indonesia and flying those found to be refugees to Australia would save lives, and cost a fraction of the cost of detention. The government will continue to waste billions of dollars sending asylum seekers to the camps on Nauru and Manus Island until we demand humane policies. The exact cost of Australia’s offshore detention system is difficult to establish, as expenditure occurs across a number of government portfolios and programs, and the Government goes to great lengths to cover its offshore detention system in a veil of secrecy. Money going to private contractors – DIBP entered into contracts for security, cleaning, catering, recreational/education, health on PNG and Nauru when centres opened. Combined value of these contracts as at December 2016 was about $3.4 billion. A report by UNICEF in 2016 estimated that expenditure on boat turnbacks, onshore and offshore detention and other programs amounted to more than $9.6 billion since 2013. The bill for chartered flights alone to Manus and Nauru came to $45 million. The Australian Government also funds the International Organisation for Migration, and so called ‘regional cooperation arrangements’, basically to help regional partners manage asylum seeker populations and stop them getting to Australia at a cost of $52 million per year. In the 2016-17 financial year, the department spent in total $9.8 million on overseas advertising as part of Australia’s anti-people smuggling campaign. These ads targeted people considering the journey to Australia from 11 countries including Afghanistan, Iran, Iraq, Pakistan, India, Sri Lanka, Bangladesh, Thailand, Vietnam, Malaysia and Indonesia. In the 2017-2018 Federal Budget, the Government included funding for offshore processing and refugee resettlement arrangements at an estimated cost of $713 million. The projected cost for the management of Asylum seekers offshore over the forward estimates 2018–21 is expected to decrease to around $430 million per year. This might be attributable to the withdrawal of some services and the departure of some people to the US. Where could the money go instead? 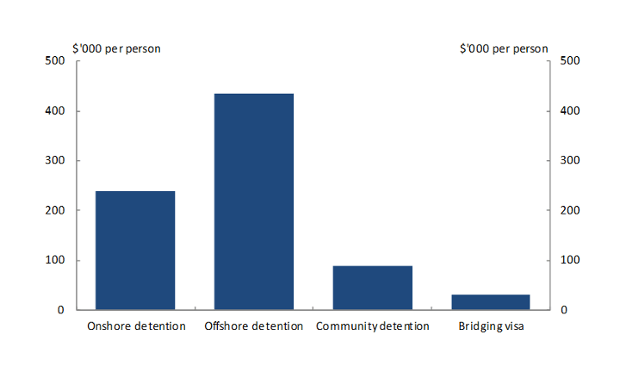 How does the cost of offshore detention compare to resettlement? It is difficult to assess the cost of resettlement. Treasury’s own Budget figures tell us that in December 2015, the Government set aside $827.4 million over four years to resettle 12,000 Syrian and Iraqi refugees. That’s $68,950 per person over four years – or $17,250 p.a. In May 2016, the Government set $880.5 million for its offshore processing costs for 2016-17 alone, to keep up to around 2200 refugees and asylum seekers on Nauru or Manus Island. On these figures, offshore detention costs 23 times more per person than resettling a refugee here in Australia. So all the money being spent torturing people on Manus and Nauru and on Australia’s deterrence program of boat turnbacks and foreign advertising could be used to resettle refugees here in Australia. The money wasted on offshore detention could also go instead towards reversing the deep cuts to welfare, education and health spending that have occurred in recent years.